A small fruit from Asia that has been sun-dried, turning the bright red, leathery outer shell to a brown color and drying the white grape-like flesh inside into a crisp texture, similar to a raisin. Although the white succulent fruit covers a small to large seed, do not confuse the seed for a nut. This seed contains a toxin and is not to be consumed. If it is consumed fresh, peel the thin sturdy shell away from the fruit and remove the inner seed. If the white fruit is allowed to ripen and dry, it is then considered to be a "Lychee Nut" and is served like a dried fruit snack or nut eaten out of hand. 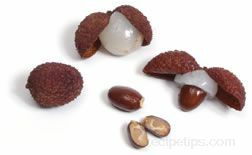 This fruit is also known as litchi nut, lichi nut, lichee nut, and lechee nut. When referred to simply as lichi, leechee, lechia, lychee, litchi, or lichee, it usually means the fresh fruit. Select bright red-fleshed outer shells that are not green. The fresh fruit is perishable and should not be stored for more than several days in the refrigerator. Canned lychee fruit with the seed removed and packed in a thick syrup is often available in food stores.